CERN, based in Switzerland, has made 300 TB of high-quality data from the Large Hadron Collider available to the public online through the CERN Open Data Portal. If you have ever wanted to catch a glimpse of the heart of matter or see for yourself what occurs when particles smash together at incredible energies, now is the time. CERN (Conseil Européen pour la Recherche Nucléaire), based in Switzerland, is a European research organization that operates the largest particle physics laboratory in the world. It operates the Large Hadron Collider (LHC), the largest and most powerful particle collider in the world, and also the biggest single machine on Earth. 1. The Primary Datasets, which are in the same format used by the CMS Collaboration to carry out research. 2. The Derived Datasets, which require much less computing power and can be readily analysed by university students or even high-school pupils. Notably, the CMS Collaboration is also supplying the simulated data generated with the same software version that should be used to analyse all the primary datasets. Simulations form a vital part of particle-physics research. CMS says it is also making available the protocols for generating the simulations that are provided. Together with the data release, viewers will also have access to analysis tools and code examples tailored to the datasets. As part of the CMS Collaboration’s open-data policy and long-term data preservation, these data are being made public, CERN announced. A team of theorists at MIT wanted to study showers of hadron clusters recorded in the CMS detector (the substructure of jets). Since CMS had never performed this particular research before, the theorists got in touch with CMS researchers for advice on how to proceed with the experiment. This developed into a fruitful collaboration between the MIT theorists and their counterparts in Switzerland revolving around CMS open data. Within the accelerator, two high-energy particle beams travel at nearly the speed of light before they are made to crash into each other. One beam travels in one direction in a beam pipe, while the other travels in the opposite direction in another pipe – the pipes are two tubes with an ultra-high vacuum inside. The beams are guided around the accelerator by a magnetic field maintained by superconducting electromagnets, which are built from coils of a special electric cable that operates in a superconducting state, efficiently conducting electricity with no resistance or loss of energy. For this to happen, the magnets have to be chilled to ‑271.3°C, which is colder than outer space. 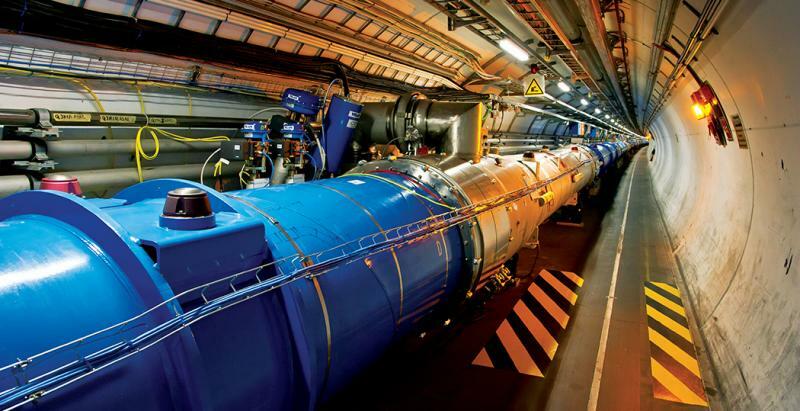 “For this reason, much of the accelerator is connected to a distribution system of liquid helium, which cools the magnets, as well as to other supply services,” CERN explains. Scientists can learn a great deal about what happens when the two beams collide. Their findings help deepen our knowledge of physics and our Universe. This video explains what the Large Hadron Collider is. It is aimed at lay people (non-scientists).